Portugal’s most famous wine region may be the Douro Valley but the wine industry in the Algarve is growing fast. I was curious to visit wineries in the Algarve and see how the wine compares. 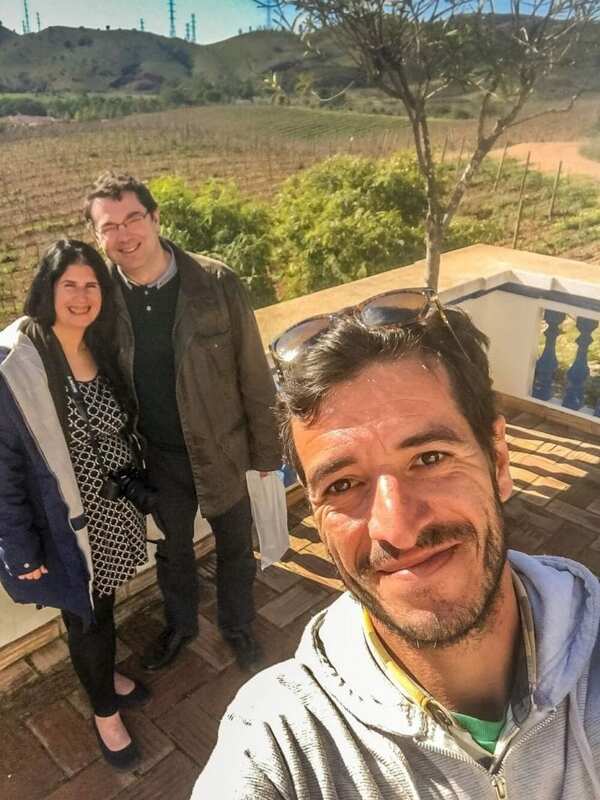 We decided to book a tour to try wine tasting in the Algarve with Algarving Tours. 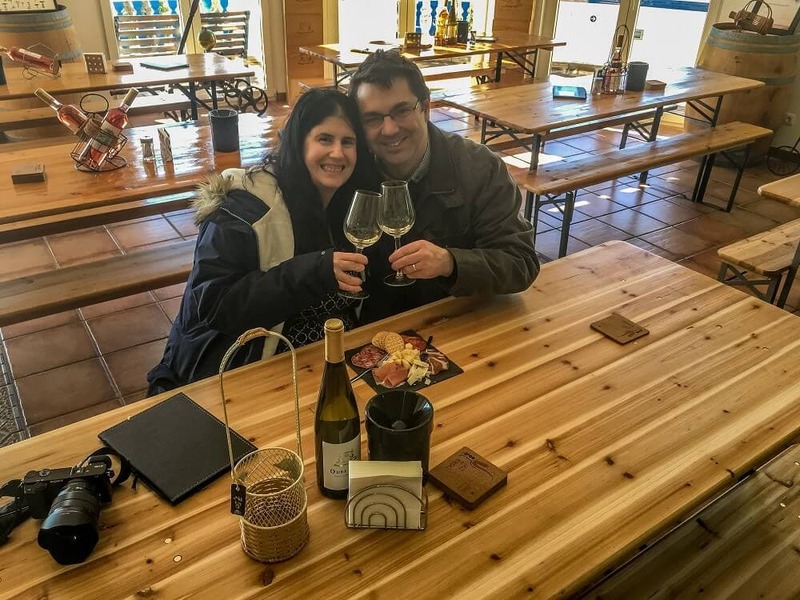 Let me tell you more about our wine tasting tour so you can decide if you want to do one when you visit the Algarve. We did a half-day wine tasting tour. In reality, it is more than just a wine tour, it includes seeing cork trees, stopping in the town of Silves, and visiting a winery. 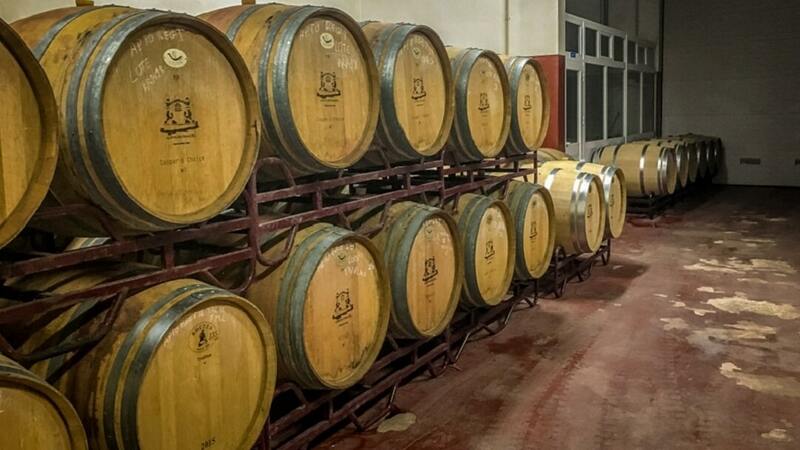 Algarving Tours also offers a full day tour that includes visiting two wineries. João, our tour guide, picked us up promptly at 9 am in our hotel lobby. He was driving a minivan with the Algarving Tours logo on it. We got in the van and were on our way. As we drove toward our first stop, João told us about some of the important industries in the area. First, we passed a golf course. Given the ideal weather year around I can see why it’s a popular area to play golf. Next, he told us about some of the important agricultural crops. The Algarve is known for its oranges and olives. They are beginning to grow avocados as well. Then, he started to tell us about the cork industry. I have to admit, I hadn’t thought about how cork was made or where it came from. João told us that 50% of the world’s cork is made in Portugal. He took us to a spot where some cork oak trees had been planted. You can easily spot the cork trees because part of the bark (the cork) on the lower part of the tree has been removed. João gave me a piece of cork he found on the ground, it was a nice souvenir. He also showed us an acorn from the tree. It was interesting to hear about cork from someone whose grandfather was part of the industry. I had no idea that it would take 25 years before you can harvest cork from a tree the first time. After that, you can harvest it once every 9 years. The older the cork the better the quality. 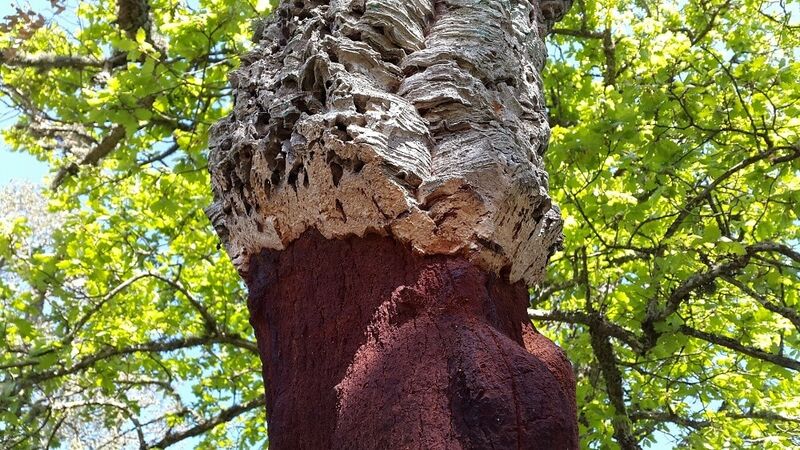 It takes trees 65 years to produce cork that can used for wine bottles. Cork is also used in NASA spaceships and as insulation for houses. It was fascinating to see where cork comes from! As we approached Silves, there was a viewpoint so we stopped for a few pictures. 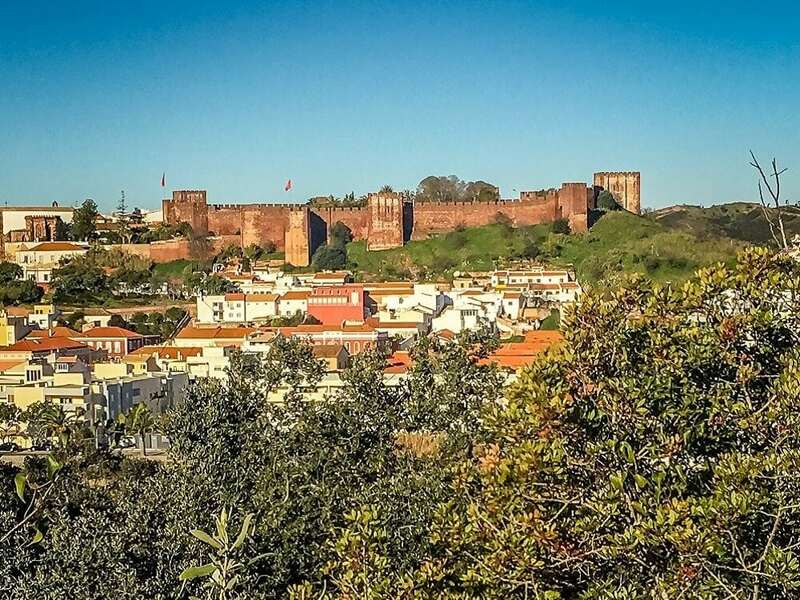 From the viewpoint, the red brick Silves castle is an impressive sight. João told us how the 1755 earthquake had affected the area and the castle in particular. Even from a distance, I could tell the restoration work was amazing. Even from a distance, I could tell that Silves Castle was worth a visit! 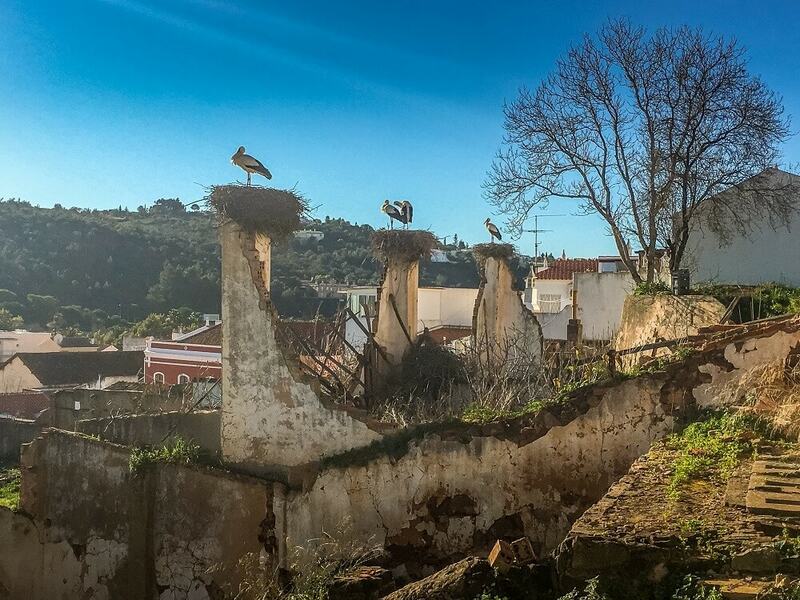 The storks love it in Silves! We drove into the town and made a quick stop to see some storks. The birds are pretty big and so majestic when they fly. Then we parked in front of the church near the castle which is at least 1,000 years old. We had a great time during the castle wall walk. João led us into the castle and paid our admission (which is included in the price of the tour). Once we were inside the castle, João gave us an introduction and we had a bit of free time to explore. While we were at the castle, we did some of the castle wall walk and visited the cistern. The views from the wall walk are stunning but you need to be careful as there are parts without a railing. I was impressed with the size of the cistern, it was probably larger than the one we saw at the Moorish Castle in Sintra. Inside the cistern, they had an exhibit about wildlife in the area. When the castle was in use, they would have stored water and grains inside. Silves Castle also has a nice cafe, some exposed archeological sites, and a pretty garden. I would have liked to stay longer, but I was also excited to head to the winery. Note: You can visit Silves on your own, it could be an excellent day trip, but I have to warn you the streets are narrow and steep. You need to be a confident driver. Don’t attempt the steep cobblestone roads when wet. If you go to Silves without a tour, I recommend parking on the outskirts of town and walking from there. João took us to the Quinta do Francês winery. In terms of wine, it is very new but quickly winning awards and gaining a good reputation. Patrick Agostini, who founded Quinta do Frances is a French doctor with a passion for wine. It’s a family run business and when they purchased the land on the Odelouca River Valley in 2002 there was nothing. 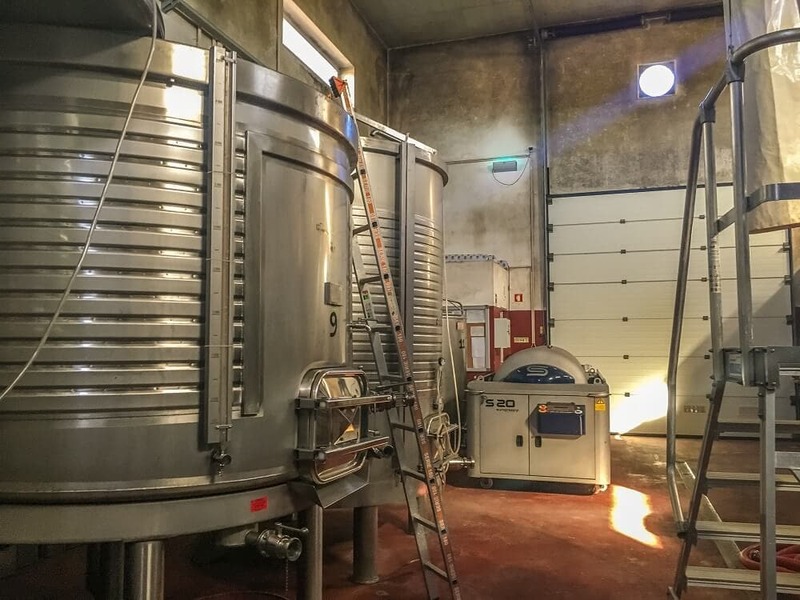 Yet, they were able to produce their first wine in 2006 and built the wine cellar in 2008. 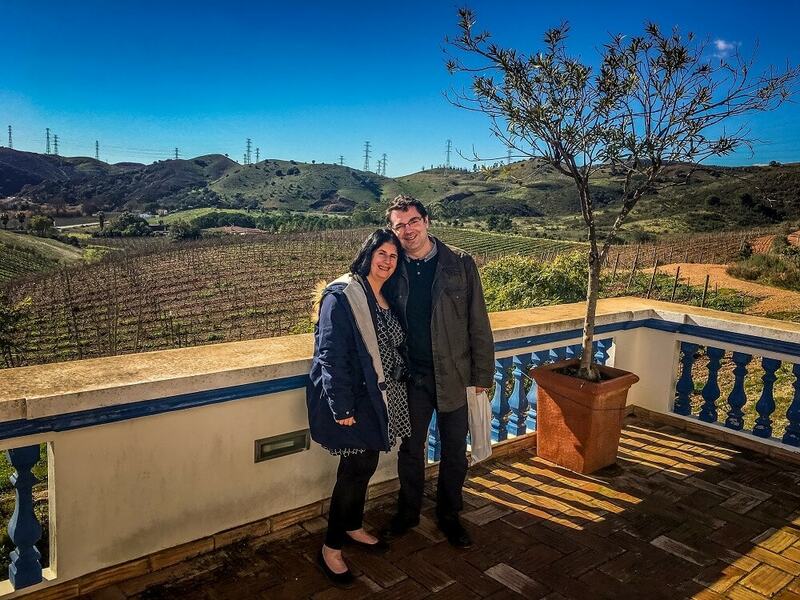 Their Algarve vineyards now cover 8 hectares. The view of the fields from the winery was spectacular even in the winter when the vines are bare. We took a few photos before heading inside for our tour. Tania, who works at the winery, showed us the areas where wine is produced, stored, and bottled. She explained all of the equipment and the different processes the grapes have to go through to make the various different wines. I was impressed that they still do some things the old-fashioned way by hand. One of these years, I would love to go back to help with the harvest. You don’t get paid but they do offer free wine. I think it would be a fun and educational experience. It’s always interesting to learn more about how wine is made. Then it was time for our tasting. The tour includes a tasting of three wines (a white, a rose, and a red). You can purchase more if you like. We decided to also try two other red wines. Tania took time to explain the differences between each of the wines, what foods they should be paired with, and how long the bottles should be opened before serving. They provided a platter of meats and cheeses to accompany the wine, which was a nice touch and it was good to be able to try the wines with food. There was also a file of photos showing the history of the winery, from when the ground was first broken, to the present day. It’s an inspiring story. We thoroughly enjoyed our wine tasting at Quinta do Frances. We loved the wines at Quinta do Frances. We bought a bottle of the Odelouca Red to take back and enjoy at our hotel. They had a special the day we went so bottles were 10% off. If we would have had more space in our luggage, we would have bought more Algarve wine! The quality you get for the price is outstanding. You can order on their website if you live in Europe. Sorry, they do not ship to other areas. On our way back to the hotel, João spotted his friend selling oranges by the road. He pulled over and bought us a handful. We tried them in the van. Even Russell who is not a big fan of oranges loved them. We took a few along with us on our hike the following day. Then, João asked if we had seen the church overlooking the sea close to our hotel. I thought he was referring to the church in Armação de Pera, but there was another one. We made a quick stop. The church was stunning on top of the cliff, but I think the things that impressed me the most were the colors of the water and the beautiful empty beach below. We had so much fun on our tour and learned a lot too. You get to see a lot during the four-hour tour and the wine exceeded our expectations! João was a wonderful tour guide. We appreciated his sense of humor, knowledge of the area, and excellent English skills. It was nice to learn about the culture and history in the region in addition to learning about the Algarve wine region. João is the owner of Algarving Tours. He is originally from the Albufeira area (where we stayed during our 2017 road trip in Portugal) so knows the Algarve well. 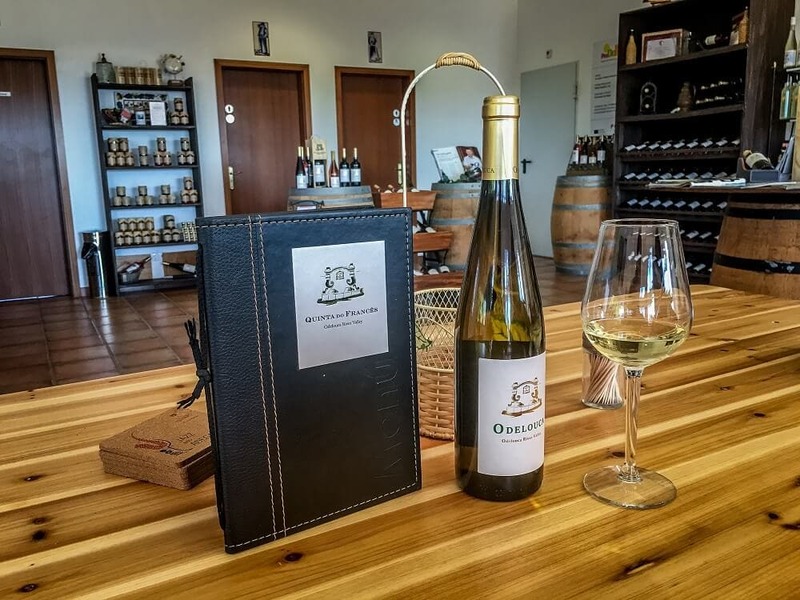 The tours are designed so that you learn more about the region and not just drink wine. He keeps the tours limited to 6-8 people to make sure everyone is comfortable. João runs all the tours himself and even does all the driving. In addition to the wine tours, João also offers a Lagos and Sagres Tour and a Cultural Photo Tour. He also does custom private tours. If you would like to do the wine tasting tour (or another tour) with João, it is best to contact him directly by email ([email protected]). Tell him that you heard about the tour on Two Traveling Texans, he will give you a 10% discount. Have you been to the Algarve? Would you like to take a tour to try the wine in the Algarve? Book your tour with João in advance especially during the high season. Tell him you heard about it on Two Traveling Texans and you will get 10% off. Be sure to bring your camera on the tour, there are several great photo opportunities. Disclosure: We were guests of Algarving Tours. All opinions are our own. Cynthia – Yes you are right, some mats do have cork in it. I wish you could have see the storks fly they were so majestic! We did love the tour and the wine! That sounds like a great tour! I didn’t know how Corks were made it that it takes a long time for one tree to produce enough material. Interesting tour. Thanks Alice. I learned a lot on the tour and we had a great time. I would love to visit Portugal and the winery in Algarve looks incredible. It is definitely a stop I will need to make. So far in my travels my favorite wineries have been in Canada – Niagara on the Lake! Jenny – I hope you get to go to the Algarve. I loved Niagara on the Lake too. The ice wine was so unique! I had no idea that Portugal was a mass producer of cork. Like you, I never knew where it came from. Although, it know makes sense why many shops in Lisbon sold cork product! I haven’t been to the Algarve region yet but it’s on my bucket list. Unfortunately I don’t drink wine, but I loved your images of the country side. And, who doesn’t love to explore a castle?! thanks for sharing. Thank you! It was a great tour and we learned a lot. I hope you get to visit the Algarve. If you do, you could do one of the other tours from Algarving Tours that doesn’t include wine. I think Silves Castle would probably have been my favourite spot, since I’m such a terrible light-weight when it comes to alcohol. As soon as you said “no railings” I was like “I want to look over the edge”! Because I’m a child at heart… and probably not a particularly safe one at that. Haha Katherine! 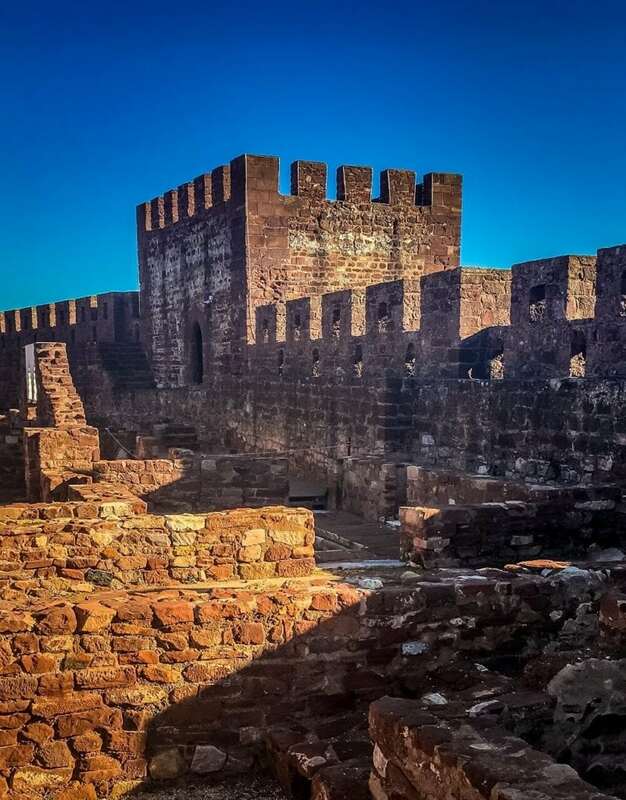 Yes, Silves Castle was impressive, but be careful on the wall walk! I’ve been on a few wine tours in different locations but I’ve never seen how the cork was made. That’s a really cool additional experience. Will have to check it out when I visit Portugal next. Natasha – Yes, learning about cork was interesting. I hope you get the chance to do the tour too. I just love Portugal. I missed the Algarve when I was there but did do some wine tasting in the Douro Valley and it was amazing. Alice – Yes, I remember your video! I still need to visit the Douro Valley. Interesting post! I’ve been to a few wine tasting tours and it’s always fascinating. I haven’t been to Algarve yet though, but it’s on my list for sure! 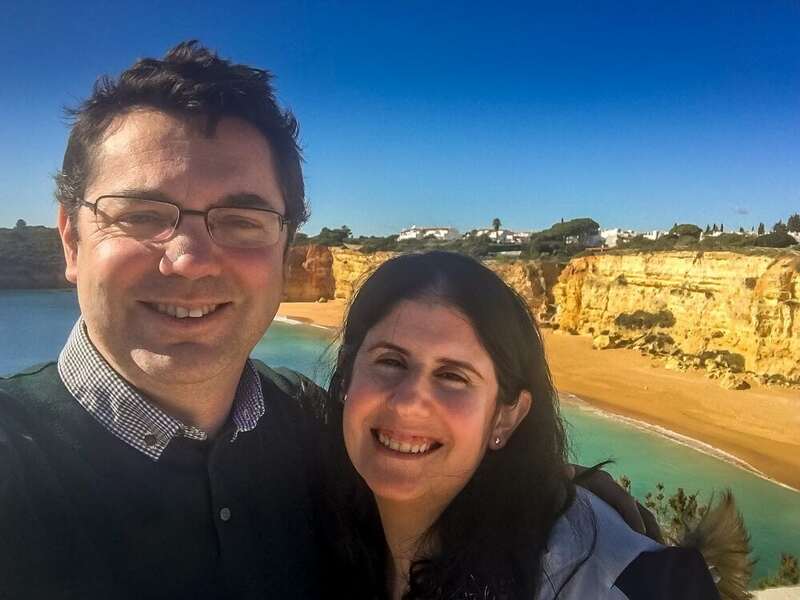 Thanks Amanda – I hope you get to the Algarve it is a great place to visit. I recently watched a TV program about stunning houses inPortugal and one of them had walls made of cork. I think it’s beautiful to promote local production through things made in Portugal. Federica – That is interesting. I did enjoy learning more about cork. I am traveling to Portugal this May and while it won’t be winter, I am looking forward to visiting the winery in Algarve. It looks beautiful in winter and I am sure it will be just as nice in Spring. Johanna – Yes, I went to the Algarve in April previously and loved it. Have a great time. I have been to a few wineries in California and thought it was such a cool experience. I will be traveling to Portugal later this month and want to make sure I’ll visit Algavre. The bonus stops you made, Silves and the castle that you visited look amazing, I want to book the same tour! Anya – Very nice! Definitely get in touch with Joao then! What part of California did you go to visit the wineries? I have been to Napa, but definitely want to try some of the other areas.